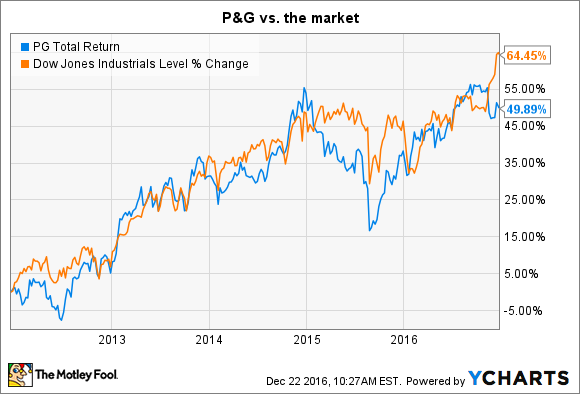 How Risky Is Procter & Gamble Co. Stock? Sure, it's been in business for almost 200 years. But that doesn't mean a P&G investment is free from risks. Image source: Procter & Gamble Co.
Procter & Gamble (NYSE:PG) is a true blue chip stock. The consumer goods giant has been in business for 179 years and boasts dozens of brands -- including blockbusters like Tide, Gillette, and Pampers -- that each generate over $1 billion of annual sales. P&G sells its products in nearly every geography in the world and its dominant global market position has allowed it to grow into a $220 billion business. Through wars, recessions, and major shifts in consumer preferences, the dividend aristocrat hasn't missed a payout increase since 1956. But no stock purchase is free from risk. Below, I'll highlight a few of the biggest worries that face P&G shareholders. The consumer products industry is highly competitive. P&G must meet daily challenges by rival global giants like Kimberly-Clark (NYSE:KMB), whose Huggies brand battles against Pampers for dominance in the diapers industry. Unilever (NYSE:UL), meanwhile, is armed with a real threat to P&G's Gillette razor blade business with its online subscription brand, Dollar Shave Club. In addition to consumer products rivals, P&G is increasingly bumping up against private-label store brands that drive prices lower and elbow its products out of valuable shelf space. Online rivals are always looking for ways to poach some of its market share, too, especially in highly profitable categories like laundry and baby care. P&G's biggest competitive advantage in these various fights is its dominant brand position. Gillette, for example, delivers a whopping 65% of the share of the global blades and razors segment. Pampers is a massive $9 billion annual business, and its market-share gap over Huggies in the U.S. recently touched a seven-year high of 10% as P&G now accounts for 45% of the industry. Overall, though, competition has eaten away at P&G's dominance lately. It lost global market share across its categories in each of the last two fiscal years. Organic sales growth recently slowed to just 1% in the fiscal year that just closed, compared to between 3% and 5% for both Unilever and Kimberly-Clark. The company is hoping to turn the tide by doubling down on its core powerhouse brands and by flexing its significant marketing muscles. But, if P&G can't get back to an overall growth rate that's at least slightly ahead of the markets in which it competes, shareholders are only likely to see declining earnings from here. Direct cash returns make up a large portion of total shareholder returns for P&G stock, which is one reason why it is so popular with income investors. In fact, the consumer goods giant will likely deliver $22 billion of capital to investors in fiscal 2017, up from the $15 billion it spent last year. Chart by author. Data source: P&G financial filings. A key driver behind those awesome returns is P&G's world-class efficiency: It routinely converts close to 100% of earnings into free cash flow. Yet, because profits have been trending lower lately, the company has had to enlist help from two other areas: cost cuts and brand divestments. Between the savings generated from slicing expenses and the funds raised through selling off brands like Duracell batteries and Coty beauty products, P&G has been able to keep the shareholder cash returns flowing. These aren't long-term answers to the company's growth problem, though. Only persistent market-share gains can deliver that solution. For that, the company needs to churn out innovation wins that help its products stand out from a sea of competitors. As investors have seen over the last five years, the stock price isn't likely to dive even during periods of intense stress on P&G's business. Its brand portfolio and efficient operating structure help protect against the kind of volatility that would wrack most stocks engaging in the type of turnaround that Procter & Gamble is attempting. PG Total Return Price data by YCharts. Yet the stock has underperformed the market since 2011, including dividend payments. A similarly disappointing stretch is about the worst that shareholders might see if the company fails in its bid to return to market-share growth.